Divergent is based on the young adult novel of the same name by author Veronica Roth. It is the first segment of a trilogy that just ended with the release of Allegiant a couple of weeks ago (the middle segment is called Insurgent). A former co-worker of mine first mentioned it to me a year or so ago and with a little motivation from this initial trailer, I finally read it a couple of weeks ago. Taking place in Chicago sometime in the future, society is now split into five factions (Abnegation, Amity, Candor, Dauntless, and Erudite). Every citizen fits into one of these factions, determined by their aptitude for the traits each faction holds dear. 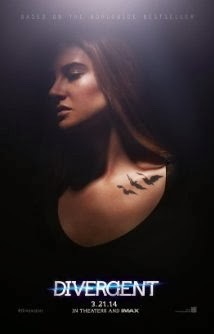 Divergent follows Tris Prior, a teenage girl who is about to make the biggest decision of her life (whether she will devote her life to her born faction - Abnegation - or attempt to pass the trials to become part of another faction). If a citizen chooses to switch factions and does not pass the initiation, they become 'factionless' society's lowest class. During this process, Tris learns that she is different, considered 'Divergent'. She demonstrates traits of more than one faction, which doesn't sound like a big deal, but makes her and those like her dangerous to corrupt leadership that is planning a takeover that would wipe out the four other factions. Divergent is a very entertaining story and after reading the book I am very excited for the big screen adaptation. It may be only a minute and fifteen seconds long, but what appears in the trailer is very faithful to the book. Of course, a lot could change in the full length feature but it's a step in the right direction. The cast is another solid step. Shailene Woodley has already shown the capacity to handle a conflicted character (2011's The Descendants) and I think that she could do well in the role of Tris. Kate Winslet looks to be a perfect fit for Erudite leader Jeanine Matthews and while I'm not familiar with Theo James (Four), it looks like he fits right in in the trailer. The rest of the cast is being filled with Maggie Q, Ashley Judd, Ray Stevenson, Jai Courtney, and Mekhi Phifer so this isn't being put together with a bunch of nobody's. My biggest fear with all of these adaptations being made from very popular young adult series is that they are often times thrown together as quickly as possible and the end result is something not nearly as entertaining as their literary counterparts. Some are absolute flops and others manage to still be somewhat entertaining despite the changes that have been made. Even fewer are able to capitalize on the popularity of their source material I really hope that this first trailer for Divergent is a sign of things to come. If so, it could turn out to be an adaptation worthy of the following its predecessor has built up. We'll find out sooner rather than later, Divergent hits theaters in March.